For current information. Please use the below links. Super Seal Low Voltage Adhesive Lined Tubing is available in both medium and heavy wall sizes. Medium wall tubes (series GMW) are used for envrionmental protection of low volage cable terminations and insulating connectors for low voltage straight through joints, splices and jacket repairs up to 1.1KV. Heavy wall tubes (series GHW) are used for mechanical protection and outer sealing of underground straight through cable joints, splices and jacket repairs up to 36KV. They both have excellent resistance to weathering, UV rays, chemicals and solvents and comform to the IEC 60684-3-247 standard and are available in multiple lengths and diamters from 1/2" up to 7.8". 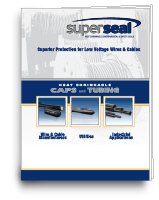 Super Seal offers a call today, ship tomorrow policy on all our in stock items.